Grab your seats and prepare yourself for some eye-candy! This post is probably one of the most beautiful posts ever – talking about the very photogenic islands/towns/ and cities in Greece is equal to pure beauty! 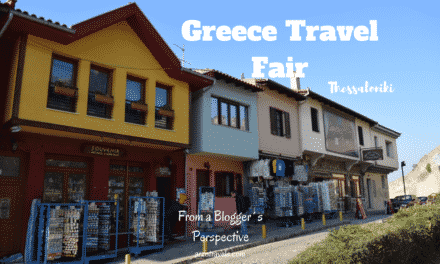 This post is about the best places to visit in Greece and has many amazing pictures, and some of my fellow travel bloggers have also shared some valuable information on things to do and see when visiting the most beautiful places in Greece. 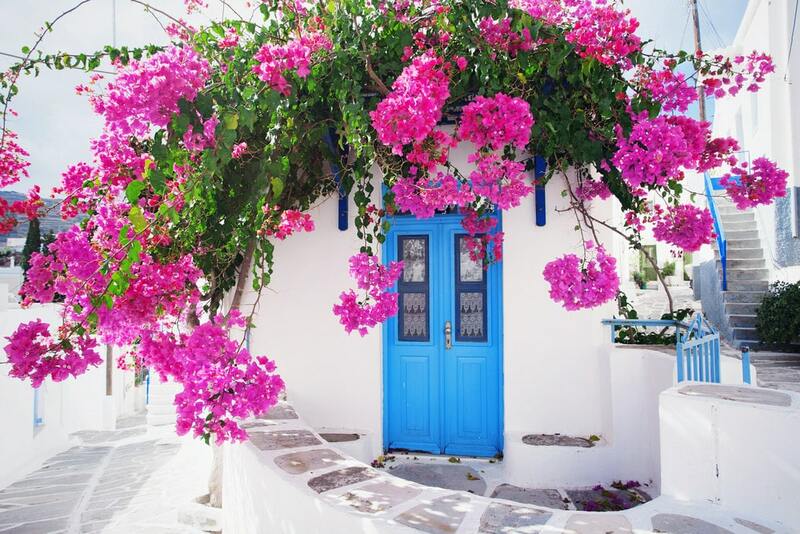 Ready to spoil your eyes with bright colorful pictures of Greece? 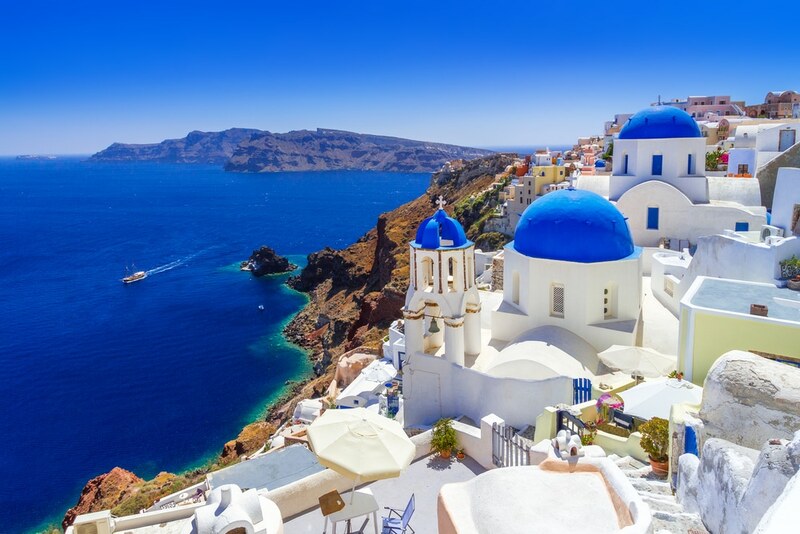 Then find out about the 22 best places to visit in Greece. 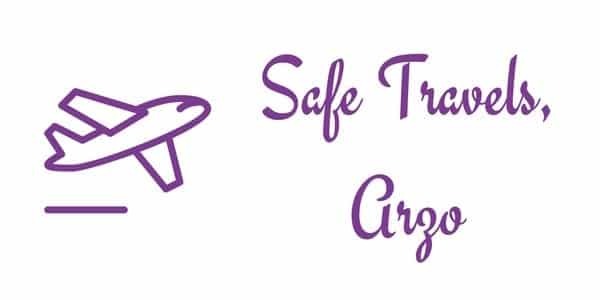 Find my detailed packing list for your Europe trip here. While planning a girls’ trip to Greece, my friend and I knew that we had to put Mykonos on our itinerary. 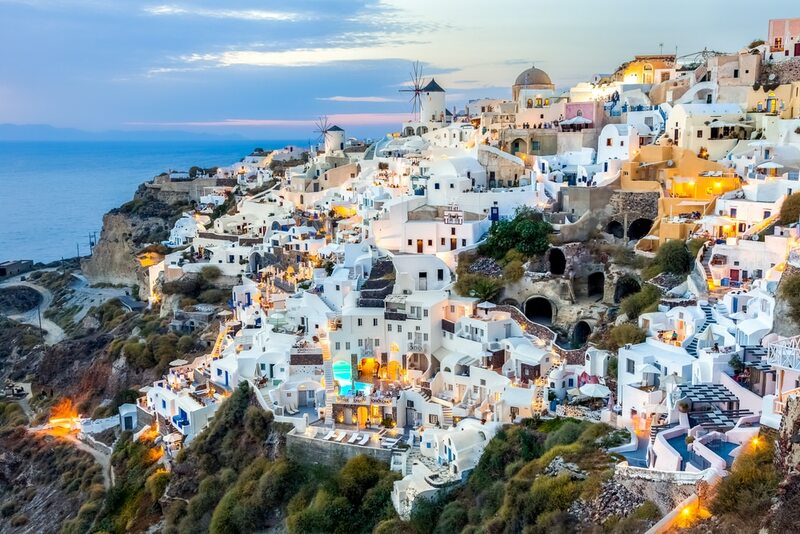 The pictures do not do this Greek Isle justice! Mykonos is the perfect place to take in classic Greek “Cycladic” architecture. White cubic buildings with flat roofs and colorful doors, windows and balconies are all around you. While in Mykonos we stayed at the Petinos Beach Hotel. It is in a great location right on the beach and only a few minutes by car or bus to the main shopping and eating areas. We visited Mykonos during the off season in October. If you want to experience the beach party atmosphere I suggest going by mid-September. There are several things you must do while in Mykonos. First of all, eat! Be sure to dine at one of the many outdoor cafes located in “Little Venice”. Take in the beautiful waterfront views including cruise ships and yachts. While in Little Venice, stroll through the cobblestone streets and go shopping. You will find very unique treasures by local artisans. Mykonos is known for their numerous windmills located around the island – climb hilltop so see them up close. 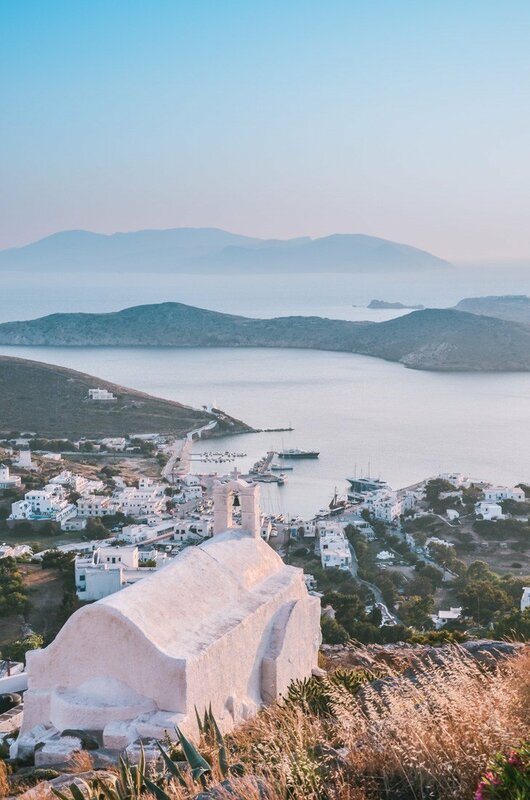 Holidays to Greece can take many different forms – partying, sailing, sunning, but there is only one island where everyone goes specifically to eat: Sifnos, in the Cyclades. The father of Greek cooking, Nikos Tselementes, was born here and every Greek has a copy of his book Odigos Mageirikis somewhere in the house. We had really heard very little about Sifnos before booking our holiday. There really is not that much written about this tiny island, which is exactly what attracted us in the first place.We made our home base the Verina Suites in Platys Gialos, one of the nicest beach areas on the island. When enquiring about our lunch options for the day, out poured the whole history of Sifnos as a foodie destination spot from Isidora, the GM. Beaming with pride, she informed us that all the restaurants are good, just with various degrees of good-ness. She followed this by explaining that, unlike other Greek islands, every Sifnos chef has a reputation to uphold so it’s tough to get a bad meal anywhere. We were starving by then, so it was time to hit all the foodie spots and we made it our mission to not miss any of these: Omega 3, O Drakakis, Nero & Alati, To Tsikali, Chrysopigi Tavern, and so many others! We also made sure to try all the island specialties: mizithra, mastelo, revithada, revithokeftedes, and manoura! Middle of the sky” is the literal translation to the word Meteora which is pretty much exactly what it feels like when you visit. 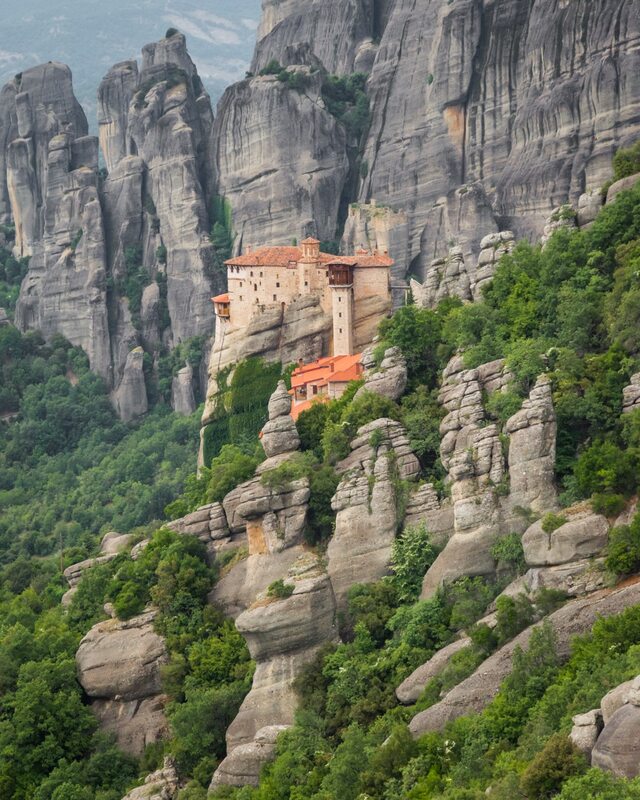 Located in central Greece, Meteora is an area containing six monasteries, each perched at the top of a giant monolithic pillar rising above the small town of Kalambaka. Dating back to the 14th-16th century, the act of building these holy buildings on the top of 1200-foot-tall rocks would have been no small feat for the monks residing in nearby caves at that time. Tourists flock to Kalambaka not to visit the town (although it is lovely and certainly worth staying for a few days to explore) but to tour these six archaeological wonders towering above. There is a lovely (albeit challenging) hike that begins at the base of the mountains in a residential neighborhood of Kalambaka and zigzags steeply up to the top where you’ll get your first of many amazing views – this one of the Holy Trinity Monastery. Follow the road as it winds along the mountain top and offers spectacular views of the valley below. If you’d rather tour the monasteries by car they are all easily accessible from the road. All of the monasteries have varying opening hours and require a small entrance fee but are certainly worth a tour. Imagine the level of difficulty to complete even small tasks during their construction as water and food had to be hauled to the top and they lacked modern luxuries such as cars or even roads. Sunset from the rock outcroppings along the road offer some of the most amazing views in all of Greece! Spetses is your traditional Greek island without the crowds. You can reach it only by boat (about 3 hours from Athens) and when you anchor at the tiny port of Dapia you’ll see whitewashed houses, local cafes and shops and narrow alley ways that are just calling out to be explored. Whilst you could easily while away the hours going from cafe to cafe, sampling frappes and watching the water-taxis come and go, one of the best activities on the island is to hire a quad bike to get around. You can hire quad bikes from several different places near the port – just make sure they give you a helmet! As you leave the port you’ll be rolling up and down hills and zipping past beautiful ocean vistas. To the west of Spetses is Bekiri Cave which is well worth stopping at. It’s a short walk down and over some rocks from the road before you see the opening of the cave. You can either swim in, or climb in following the narrow path and then swim out into the sea. Just watch out for the rocks as, depending on the tide, they can be dangerous. After a swim and exploring the caves head north to Vrelos Beach and take in the sunset. The beach is small but has a beach bar with surprisingly good cocktails and loungers. It’s such a good spot to while away a few hours. When I visited in June the beach was completely empty too! Ios is a true paradise for those seeking both fun and relaxation. This so-called “party island” has an amazing nightlife but also many secluded beaches to hide from the crowd. 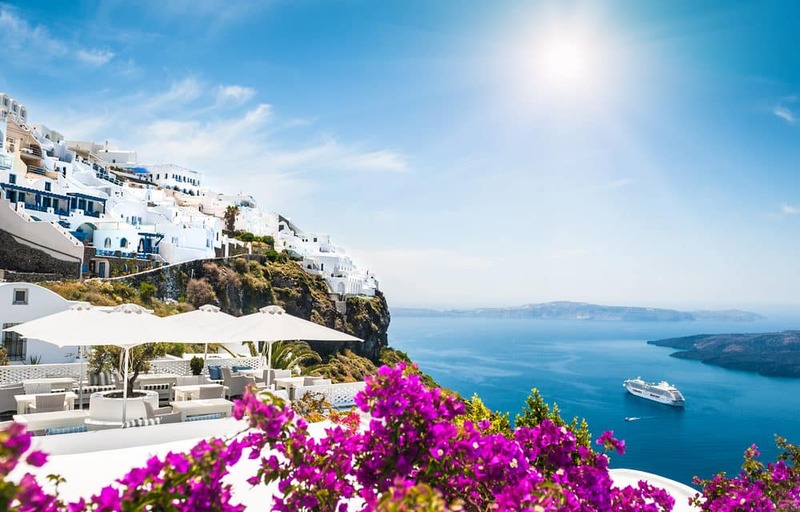 If you are looking for typical Cycladic white&blue houses, but you have enough of crowds in Mykonos or Santorini, you’ve come to the right place. Chora is the main, extremely picturesque town in Ios with a maze of narrow streets. At sunset, go up the hill in Chora to admire a splendid view of the Aegean Sea soaking up in the sun. While in Chora, don’t miss Katogi. This is the BEST restaurant in Greece for me, serving traditional Greek dishes with a modern twist. In these cozy interiors, you’ll feel like you’ve just visited a good friend at home. This place is very popular, so you would need to wait for the table, but it’s definitely worth it! Make sure your ferry stops in Paros for a few days before you head onto Santorini. It’s about three hours from the famous island, but offers a much more laid-back atmosphere and an authentic Greek way of life. The ferry port is perfect for a bit of shopping and some nightlife after the sun goes down at the Bebop rooftop bar. Close by for sunbathing during the day is Krios Beach – In sunny October, I was the only soul on the sand. The best way to experience Paros is to rent a house in one of the little villages, like Lefkes. It’s 15 minutes from the beaches but in a beautiful white-washed town with delicious restaurants and bakeries. This one accommodates six people, has a massive outdoor space and even a sitting room that looks like a cave (save money when booking your first stay with Airbnb with my link). The hosts stock your fridge with fresh produce and dairy from local business too. When it’s time for dinner though, head a few minutes uphill to Taverna Flora to catch the sunset, have a glass of wine and conquer the biggest Greek salad you’ve ever seen. If you’re feeling adventurous, you can try the old lighthouse next to Kolympithres beach, near the town of Naousa. 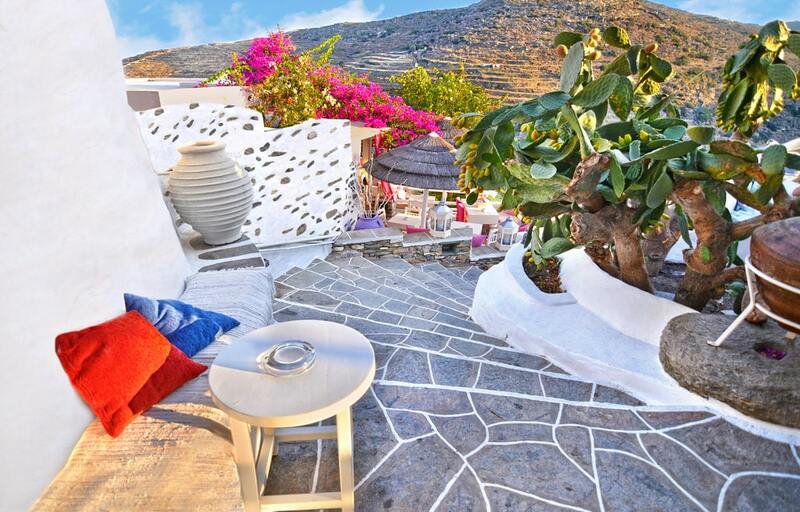 It is a 30-minute walk, and the location rewards you with unrivaled views of the Aegean sea. In order to get there, you head from Lefkes to Naousa, drive past the town, past Kolympithres, until the end of the road. Naxos is the biggest island of the Cyclades complex in Greece. Conveniently located 5 hours away by ferry from Athens and with an international airport it has become a popular holiday destination. Nevertheless, it has maintained its authenticity and quality. 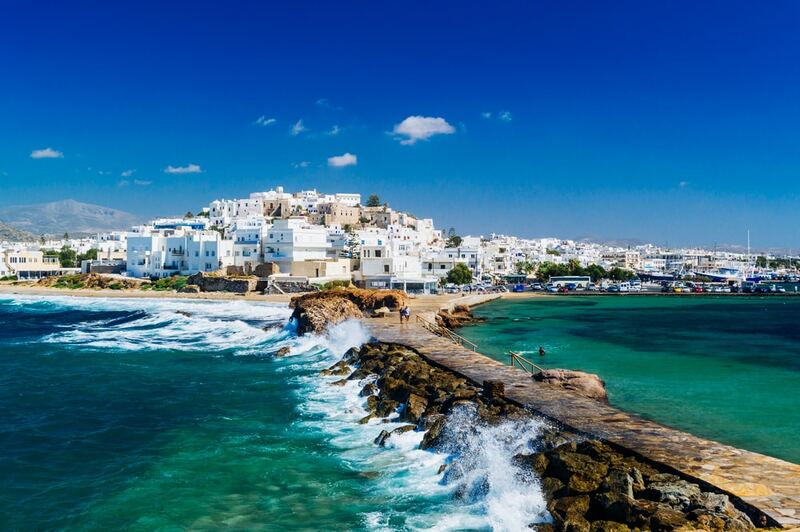 There are many places you can visit in Naxos so renting a car is totally recommended although there is a bus covering the most popular destinations. There are plenty of things to do in Chora, the capital of the island. Very close to the port you can visit Portara (great door) which is actually a huge marble gate that was part of a temple dedicated to Apollo 2.500 years ago. This is the perfect spot to watch the sunset. You can also lose yourself at the winding alleys of Chora with the cute restaurants and shops until you reach the Castle. Naxos also has many picturesque mountainous villages that have maintained its traditional architecture. Some worth visiting are Halki and Koronos. Naxos is also famous for its sandy long beaches like Agios Georgios in Chora, Agios Prokopios, and Agia Anna. There is also a wealth a sports activities on the island, many hiking paths, windsurfing, kite surfing and boat excursions to nearby islands. If you are planning a trip to Greece Naxos should be on your itinerary. Peloponnese the peninsular region in southern Greece is home to a gorgeous coastline with pristine beaches, pretty medieval towns and some of the interesting archaeological sites. No wonder it has been voted as one the best places to visit in Europe by Lonely Planet in 2016. Peloponnese is a large region with a lot to offer you can plan a tour exploring the best of Peloponnese – the Corinth region, Mycenae, Nafplio, and Epidaurus which is also a popular day trip from Athens. Your first stop on the tour would be the man-made wonder Corinth Canal, the 6.4 km canal which separates mainland Greece from the Peloponnese region. 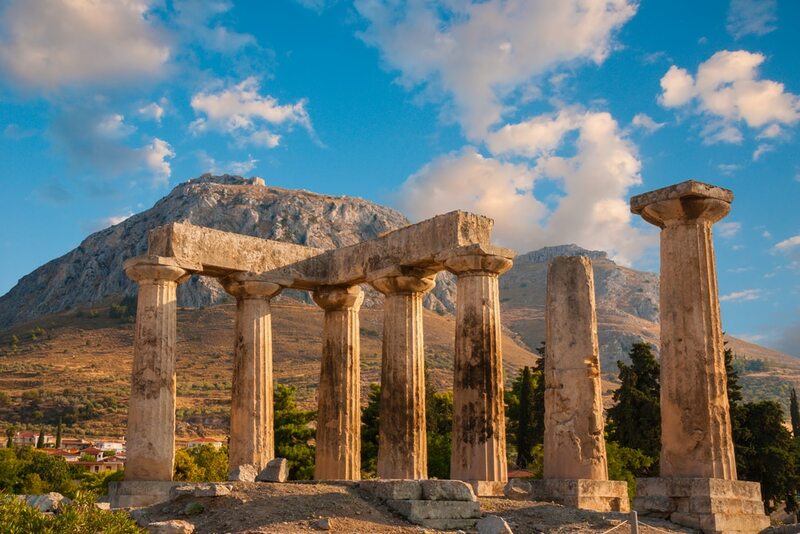 Corinth region is also home to the ancient Corinth which is an ancient archeological site which was a major commercial center during the ancient times. You can find some of the interesting archaeological findings in the museum located on the same site. While Mycenae also has an archaeological site, Nafplio is more of a charming coastal city with neoclassical traditional buildings. The most important site in Epidavros is the Epidavros theater which is one of the best preserved ancient theaters in Greece and is still used for musical concerts and plays. There are many places to visit in Peloponnese which is apt for a history buff of which ancient Olympia, Mystras, the medieval village of Kastro and ancient Nemea are few to name. Milos may not be one of the most popular Greek islands, but with over 70+ beaches to choose from you will have plenty to be amazed by. 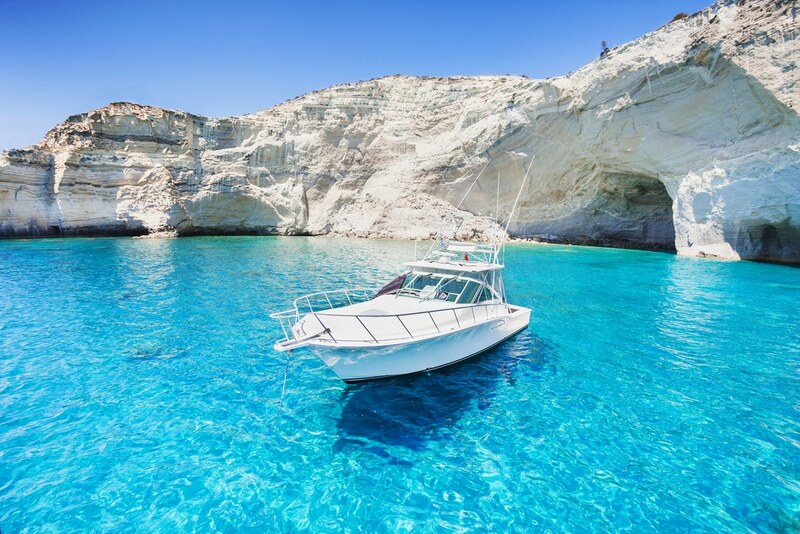 If you’re looking for some secluded beaches, crystal blue/green waters, picturesque blue and white towns, all without the mass crowds, Milos is the perfect Greek island. My favorite thing to do in Milos is rent an ATV to explore the island. Not only is driving an ATV an adventure in and of itself, it allows you to get to all of the off beat places. Sarakiniko is the most unusual beach on Milos with a lunar-like landscape formed by volcanic rock formations. The bright white rock contrasting with the rich blue sea is quite something to see. On the south of the island, don’t miss Firiplaka Beach, the prettiest beach on the island in my opinion. The backdrop of the clear turquoise waters framed by the massive plunging red rock cliffs is stunning. Sip on a cocktail at the little beach bar and enjoy mother nature at its finest. While on Milos, make sure to stop by one of the many traditional fishing villages, colourfully painted with a boat garage on the bottom. The fishing villages are something unique to the island you won’t see on many other Greek islands. Make sure not to miss Mandrakia and Klima. A visit to the abandoned sulphur mines is also great for photography lovers, as it is located right on the water. It’s a bit hard to get to with the rough roads, but the journey out there makes up half the fun. Milos is small, super safe for the solo traveleler, easy to navigate, and has loads to do and see. It is the ideal Greek island if you ask me! If you are looking for an off the beaten path island in Greece then you should definitely consider the North Aegean island of Lesbos. The island, just a few kilometers away from the Turkish mainland, got in the news a lot because it suffered heavily at the times of the refugee crisis in Europe. Those times are long gone and this beautiful island is now a pretty quiet place away from the tourist trail in Greece, and even so utterly stunning as the others. Lesvos is a great place to explore on a road trip around the island and stay overnight in a couple different places. In the North definitely, don’t miss the picture-perfect town of Molyvos with its steep cobbled stoned streets and great ocean views. In the South, you will find Plomari, the birthplace of the famous Greek drink Ouzo. In this lovely little fishing village are two Ouzo museums, a bunch of idyllic bays and some completely deserted beaches. Also, don’t miss the Petrified Forest with fossils dating back millions of years ago. This is also one of the reasons the complete Lesbos Island is a UNESCO heritage site. Last but not least spend a couple nights in the capital of Lesbos, Mytilini. Visit the history museum and hike up to the castle on top of the hill. Mingle at night with locals in the artsy district around the port and find hip cafes and bars to go out in this university town. Hotel Pyrgos has an amazing rooftop looking over the city of Mytilini. Last but not least spend a couple nights in the capital of Lesbos, Mytilini. Visit the history museum and hike up to the castle on top of the hill. Mingle at night with locals in the artsy district around the port and find hip cafes and bars to go out in this university town. Hotel Pyrgos has an amazing rooftop looking over the city of Mytilini. 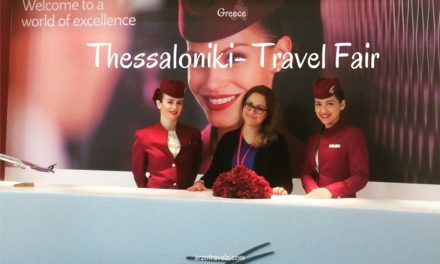 Greece has always been the ‘one that got away’ during my travels and I never had a chance to visit until a last-minute flight from Sofia to Copenhagen put me with a 24-hour layover in Athens earlier this year. 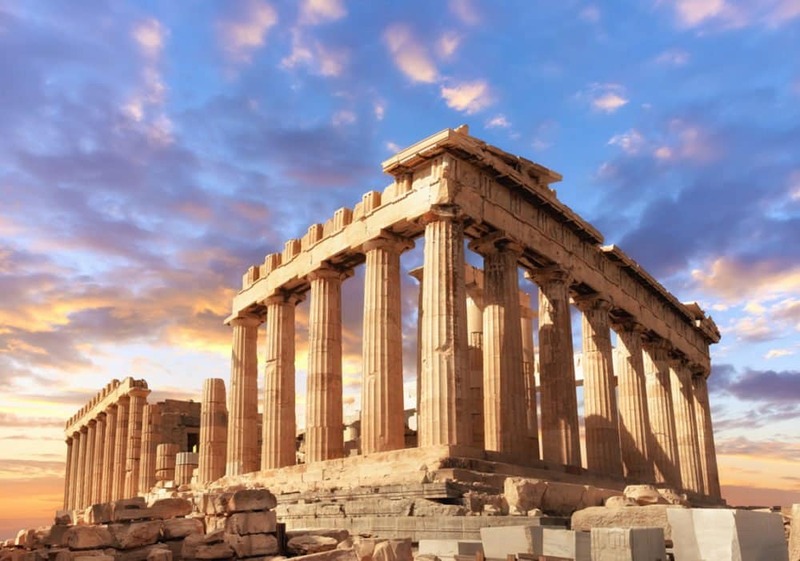 I knew very little about Greek history as someone who studied years of Latin, but I did know that the history is ancient and one of the most influential in our modern society. After arriving in the city from the airport, I perused around and couldn’t help but feel like I had missed out all this time by avoiding coming to Athens! The city left me in awe by its beauty and overjoyed by its food and smells. I spent much of my day walking through Anafiotika and other parts of the old town while marveling at the architecture, friendliness of the people, and views of the city. During the latter part of the day, I decided to wander to Exarchia, a neighborhood known for its street art, urban resistance, and cool and quirky cafes and businesses. The neighborhood made me feel like I was on another planet, but I loved it and chatted with locals when I could and took a few photos here and there. The city of Athens is like an onion; every neighborhood and block is a layer and once you peel it back, you are exposed to a new side of the capital and it fuels your curiosity of the complexity of the place. I know the beaches of Greece are utterly magnificent. But, as a city person, I can’t help but think that the rest of Greece has some big shoes to fill because I am absolutely enamored by Athens. 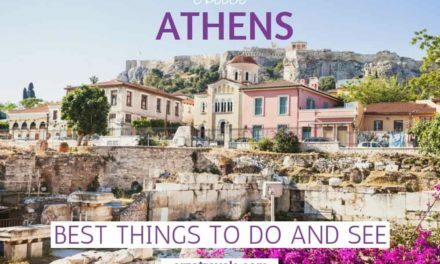 Find out more about the best activities in Athens. The quaint island of Hydra is renowned for its unique architectural charm, dynamic lifestyle, historical importance and for its no cars policy. Just a short two-hour ferry ride from Greece’s capital — Athens, Hydra is a great destination to visit at all times of year. Here, the cars are replaced with donkeys who will greet you upon your arrival at the port. Since the 1960s the island became Hollywood’s favourite hotspot, where refined vacationers fled in search of warm sunny weather, laid-back Greek hospitality and vibrant nightlife. After the filming of the Boy on a Dolphin movie starring the glamorous Sophia Loren in 1956 — Greece became a popular tourism destination. Hydra is a romantic island, one of those places were you retreat to escape the typical holiday resorts. Spend your days walking around the charming alleys, enjoy a cup of coffee in one of the cafes lining the island’s vibrant port as you watch the mooring yachts and fishermen boats gently roll on the water. Explore the island’s numerous museums some of which are housed in traditional mansions that once belonged to the shipowners. Go on a guided horse trekking tour and explore Hydra’s breathtaking scenery, monasteries, and beaches. 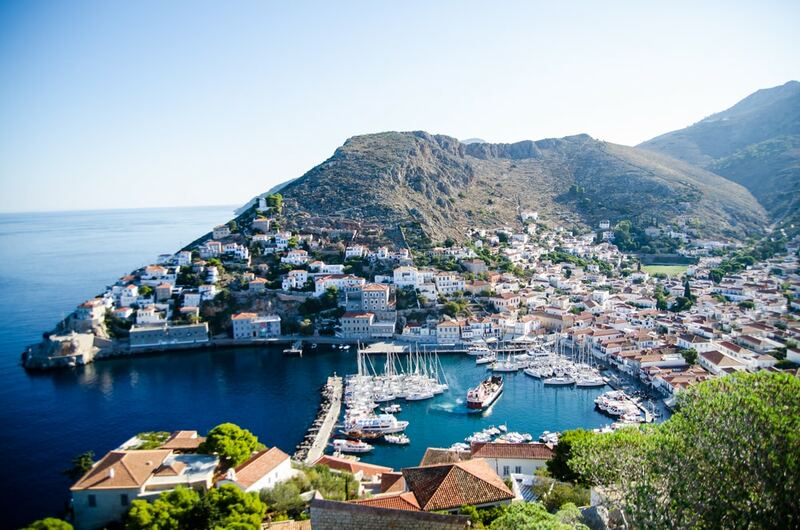 For those who wish to discover beyond Hydra’s harbor should take the route from Hydra town to Kamini which passes through a picturesque traditional fishing village with mesmerising Aegean Sea views. 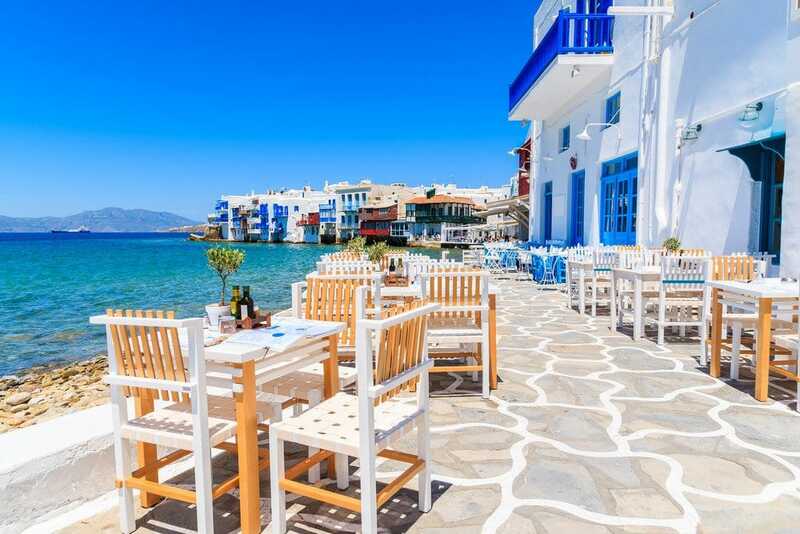 Stop here for a delicious lunch in one of the two famous local tavernas — Kodylenias or Christina, both serve exceptional Greek dishes and fresh seafood. Hydra is not particularly known for its beaches but it does have a few. If you wish to stay in a hotel with a private beach then Four Seasons Hydra Hotel is a great choice for couples and families with young children alike. Hydra is a magical island where you will make friends not only with the locals but with the numerous cats that practically rule the island. Paros, a rather less known gem of the Cycladic islands, is becoming more and more popular especially among water sport lovers. It’s geographic situation and its exposure to the wind made it a coveted destination for young and active travellers. For those that want to relax and just enjoy the quietness of the sea, I recommend a day trip or even staying for a longer time in Antiparos. Antiparos, only 1.9 km from Paros is famous for its pristine beaches and its relaxing, laid-back atmosphere. It can be reached from Paros by ferry or by a 10 min jet-ski ride. The main settlement is Pounda and it has the characteristic Cycladic architecture with white houses, framed by bright flowers and cobbled streets. Like its “parent island” Paros, it is famous for kite- and windsurfing, but on less crowded beaches. 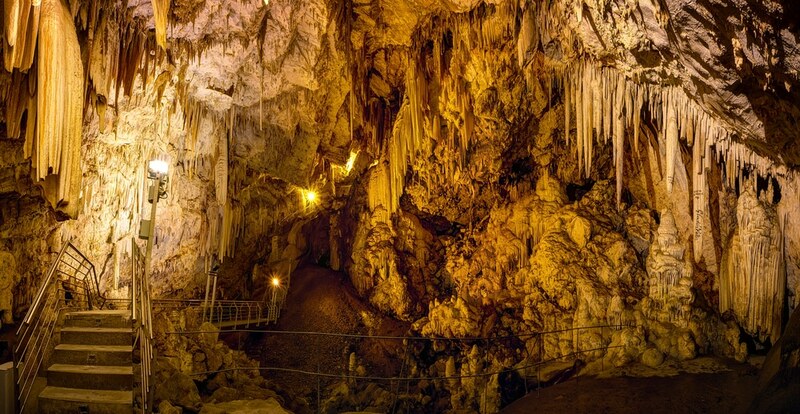 Anitparos’ main attraction is without any doubt The Cave, a stalagtite grotto in the island’s center. Several dates and names are painted on its walls, which go back hundreds of years. You shouldn’t miss The Castle, the ruin of a Venetian castle dating from 1440. My favorite thing to do in Antiparos was though exploring the many hidden beaches and coves – there seems to be a mere infinite number of them. Astypalea is a beautiful butterfly shaped island in the middle of the Aegean Sea. It is a bit off the beaten path, but it can be easily reached by ferry or by plane. It is for visitors, who are looking for an authentic Greek experience. The island is less touristy than most Greek islands, therefore, the locals are friendly, the food is freshly sourced and the beaches are pristine. Astypalea has some incredible restaurants, where often times local music is played. Hotels and restaurants are reasonably priced as the island has not been invaded by tourists like many other Greek Islands. The typical white-blue Greek architecture can be observed everywhere. It is an underrated hidden gem that you will surely fall in love with. Best activities: Hopping on a boat and sailing around the island, hiking the nearby mountains and discovering the unique vegetation of the island, spending the evening in a local restaurant with the Greeks, drinking Ouzo and singing to live music. As Crete is quite a big island, we have two parts on Crete – divided by northern Crete and Southern Crete. Let´s start with Eastern Crete. Crete is the largest island in Greece and one of the biggest in the Mediterranean. On our recent trip to Crete, we stayed in Hersonissos, a coastal town near Heraklion. Crete is surprisingly beautiful with is charming Venetian town like Agios Nikolaus. 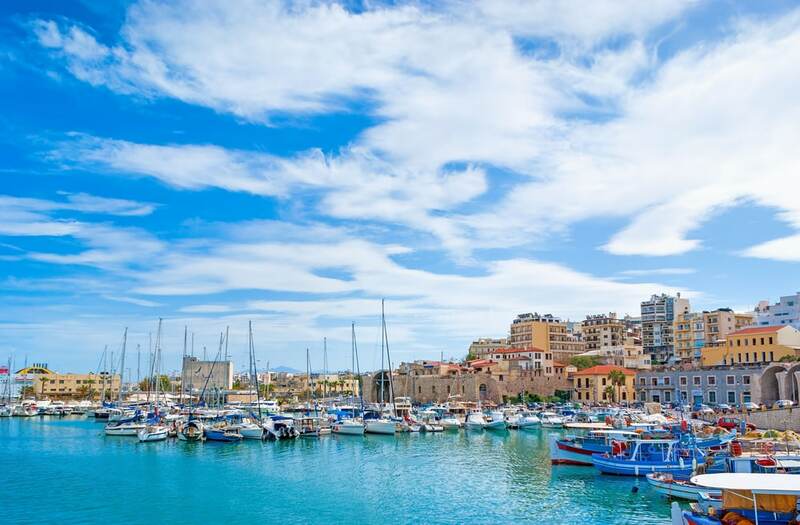 Heraklion is the capital of Crete. There are plenty of things to do and places to visit in the city. The Venetian fortress is worth a visit and you can learn the colorful history of the Venetian and Ottoman occupation in the island. The palace of Knossos is one of the historical treasures in Crete. It was built during the Minoan era and has very important historical value for the Cretans. If you are up for an adventure, not far from Heraklion is the Psychro cave which is the birthplace of Zeus located at the Lasithi plateau. It is definitely a great day adventure hiking and enjoying the landscape. Just be careful on your descent in the cave. The Psychro cave was believed to be the birthplace of the Zeus. You can drive up to the mountains and on to the plateau. Alternatively, you can join group tours from Heraklion. We traveled all around Crete for a few weeks with a rental car and found our favorite region to be Chania (pronounced HAN-YA). That’s because the prettiest beaches are in the western part of the island. If you only have a few days in Crete and don’t know where to go, my opinion is to spend all your time in Chania. You’ll most likely need a rental car to get around, but they are extremely affordable in Greece! This is where you can check out Balos Beach. Which has some of the prettiest water I have ever seen! It’s located right past Kissamos and is located at the end of a never-ending dirt road followed by a long walk down to the beach. Its seclusion makes it not completely packed with tourism even in high season. My other favorite beach in this area is Stefano Beach which is located down a long, zig-zagged, straight downward scary road. However, once you arrive at the small parking lot you’ll find the terrifying car ride was well worth the view. Once you’re at the car park you still have a steep, 15-minute hike down to the beach. Once you arrive on the beach just relax and take in the views with almost no one else around you. Make sure to bring some snacks as there is not much around this area and you will not want to make that drive all again just for some food. 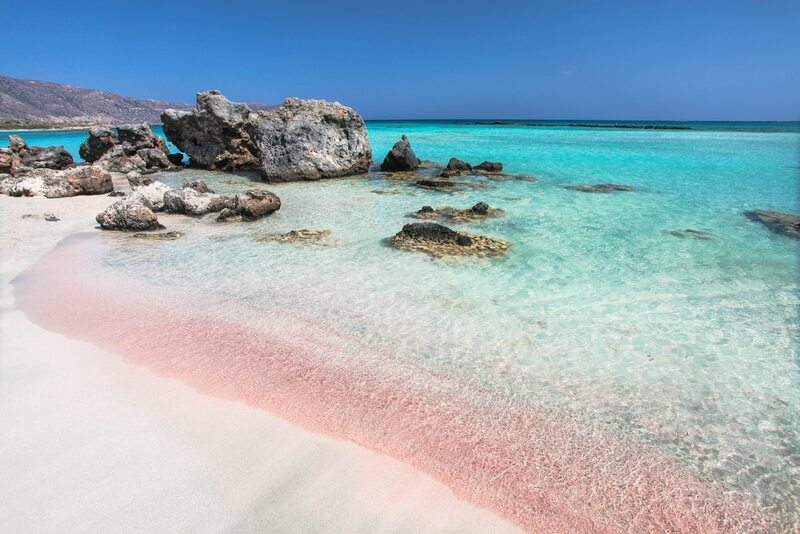 My last favorite beach is Elefnisi, which is the pink beach of Crete. Yes, the sand is all shade of light pink and it twinkles so brightly in the sunlight. The pink sand is actually caused by the coral being broken down into tiny fragments. Between all of the beaches, this by far is the easiest beach to get to. Whichever one you go to (or if you go to all) you’re sure to love! The island of Rhodes is called the island of the sun and that is to be taken literally. It has over 3000 hours of sunshine per year. According to Greek mythology, it was due to the fact that Zeus, the king of the ancient Greek gods, had redistributed the earth among the gods and had forgotten the god of the sun Helius, but remained modest and contented himself with an island, which he later named after his wife Rhode. The Greek archipelago of Dodecanese consists of 160 islands. Dodecanese means 12 islands and stands for the 12 inhabited islands which has now risen to 19 with Rhodes as the main island. When traveling to the island of the sun and spending your holidays there, you will never get away from it. 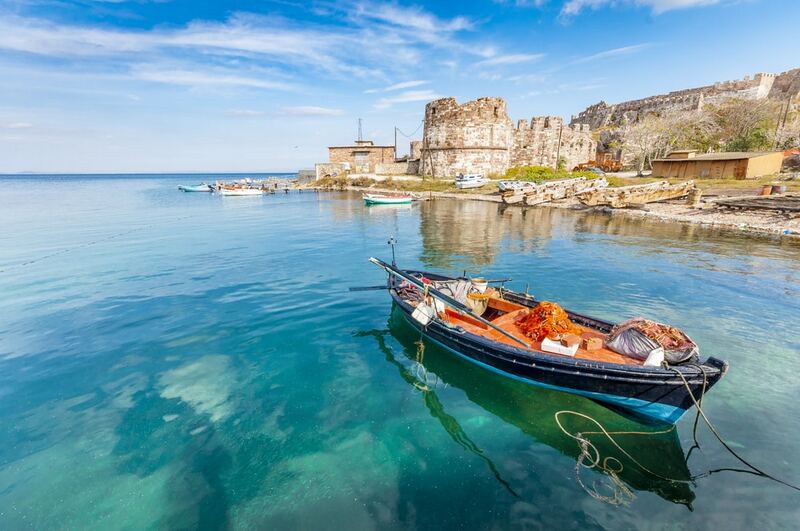 However, Rhodes has much more to offer than just a beach holiday (which is great as well). Get a rental car and experience the island yourself. Be sure to visit the Grand Master’s Palace, the city walls of Rhodes Town, Rodini Park and the Knights Street. 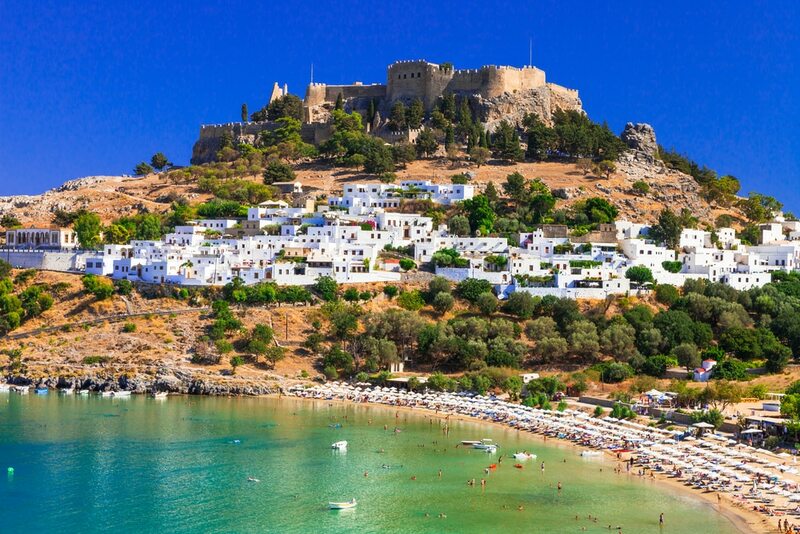 Also, you should not miss the “white” village Lindos, the beautiful Tsambika Beach, the Kallithea Spa and, of course, the famous Anthony Quinn Bay. Get a rental car and experience the island yourself. Be sure to visit the Grand Master’s Palace, the city walls of Rhodes Town, Rodini Park and the Knights Street. Also, you should not miss the “white” village Lindos, the beautiful Tsambika Beach, the Kallithea Spa and, of course, the famous Anthony Quinn Bay. Heavy rain – that is how my time in Lindos started. While we jumped out of the bus to start our guided tour we headed all to a little shop to buy umbrellas first. The minute we got them and started our Lindos walking tour the weather cleared up and Lindos presented itself in its best dress. Our guide had mentioned more than 20 times that Lindos was picturesque – and indeed it was. This small town on Rhodes is known for its clifftop acropolis and great views over the sea. 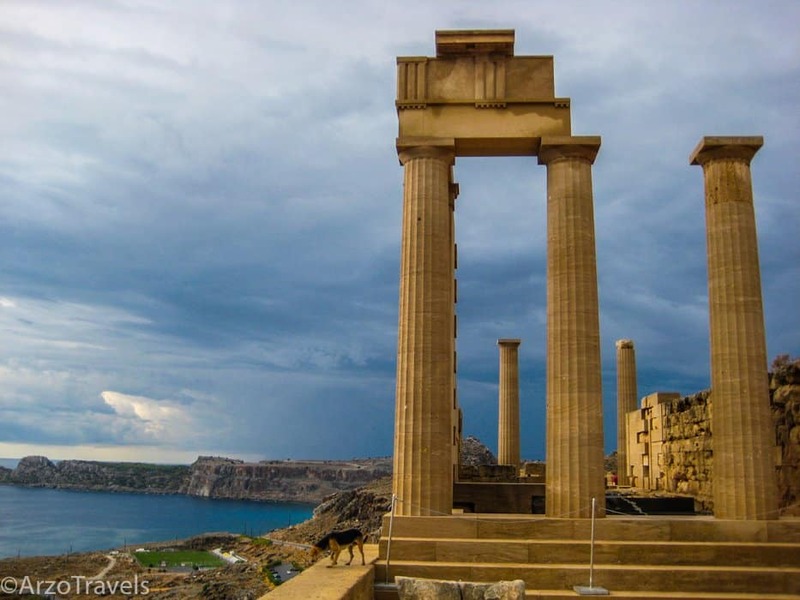 Lindos used to be a major naval power in ancient times – now, it is a very popular tourist spot, and there are many reasons why. The Acropolis, which dates back to 280 BC, is definitely a must-see place in Lindos, but so are the little shops that you will pass along your way to the Acropolis. The view from the top is just amazing! Lindos makes a great day trip if you stay on Rhodes island – though it may seem unbelievable, one day might be enough to discover the most important places of Lindos. And if you are finished with the sightseeing of all the beautiful, ancient sights, and you‘d like to chill, you can just do so at the beach. Lindos, a place that combines history and beaches – what else can you ask for? Syros is poised to become the next “it” travel destination in Greece. Gorgeous beaches that are not yet crowded with tourists, amazing food, lots to see and do — all of this at some of the best prices in the entire country. As it is not yet as popular as other islands the locals are still genuinely excited to receive tourists. They are happy to show you their shops and welcome you into their restaurants. Syros was originally a medieval settlement, making for an island with an interesting and somewhat complicated history. Make sure to ask locals about why there are so many cats on the island! Colorful blossoms hang over the narrow alleyways and whitewashed houses. Looking up, you’ll see churches with bright domes atop the hills surrounding the city. Ermoupolis, the main town, has been declared a National Historic Landmark by the local government. This means the design integrity will be preserved. Make sure to visit the Apollo Theater located near the town center, as it’s a scaled down version of La Scala. But, most everyone wants to visit the beaches when vacationing on Greek Islands. Syros has several beaches. To find the best and least visited beaches, take a boat and head north of Kini beach. 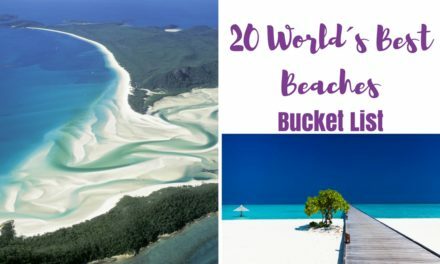 These are even more gorgeous than the impressive main beaches. 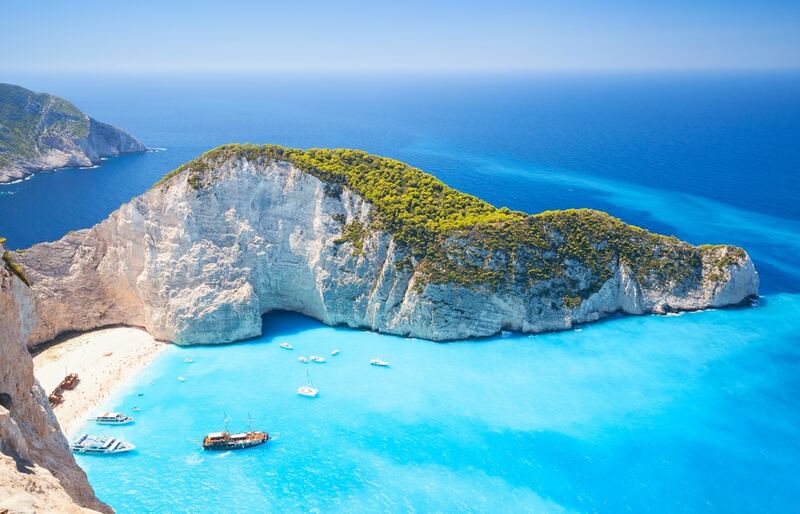 Zakynthos or Zante is a well known Greek island situated in the Ionian Sea. During the Venetian ruling, it was often referred to as Il fiore di Levante translating as the Flower of the East. Due to its nobility, Zakynthos was a jewel of their empire. Modern Zakynthos has gained tremendous popularity for its landmark which is the Shipwreck Beach also known as the Navagio Beach. The island is a nature lovers’ paradise as it is dotted with numerous white beaches, surrounded by turquoise waters and remarkable caves such as the famous Keri Caves and the Blue Caves. The best natural experiences are accessible by boat, so make sure to rent a boat for the day and explore the surrounding beaches and coves including the Marathonisi Sea Turtle Island where the endangered Caretta Caretta loggerhead sea turtles lay their eggs. If you are lucky it is an amazing natural phenomenon to witness firsthand. For the best views of the island head over to Bohali, perched on a hill overlooking the harbor. During the Venetian ruling, Bohali used to be an aristocratic neighborhood and has maintained its unique character until this day. The best time to visit would be around sunset where you can witness the magic when the sun gradually disappears below the horizon. Zakynthos is also known for its exceptional cuisine, for a night of delicious food and kantades which are the characteristic songs of the Ioanian islands head over to Varkarola, located in the main port of Zakynthos. The natural beauty of Zakynthos is guaranteed to amaze you as some of its scenes seem to be taken from somewhere else, out of this world. 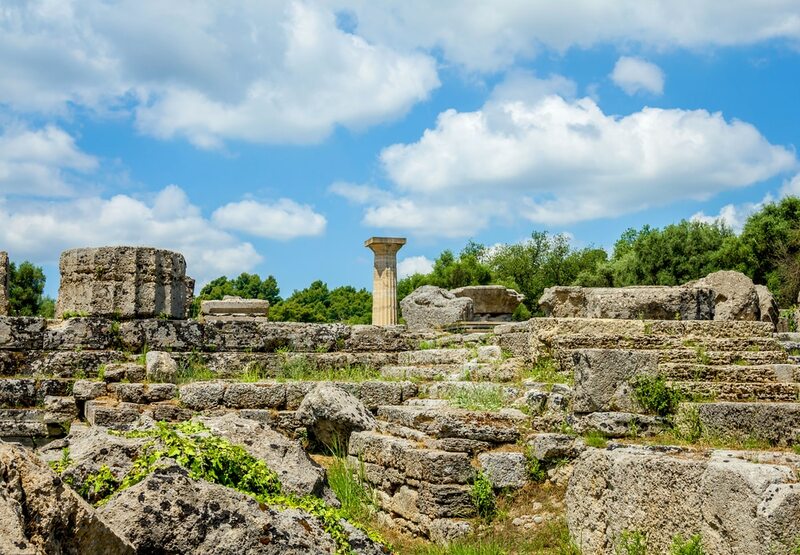 Katakolo or Katakolon is a very popular port in Greece if you’re on a cruise, however, if history excites you, you need to head to Olympia which is located about 20 miles away. Once a sanctuary dedicated to Zeus, 500 years in the making, the site now is full of ruins. The games were established in 776 BC and were held at this very site for centuries till a powerful earthquake destroyed it, only to be unearthed aeons later in the 1700’s. The archaeological site contains temples dedicated to various Greek Gods and heroes. The one dedicated to Hera and the amphitheatre are quite picturesque, helping one to visualize how it may have looked before being demolished. The highlight, however, is the stadium, the original track where you can still take a sprint! Ensure you allocate sufficient time to visit the Archeological museum containing some great exhibits and the Museum of Olympic Games. The ticket (12 Euro for an adult, free for a child) includes entries to all three sites. You could definitely explore the site by yourself as there are signs placed everywhere which help in understanding its history. After spending time at the site if you’d rather relax a little you could head off to the Olympia Land Winery, a quaint family run winery. Amanda, the owner’s daughter usually takes visitors on a tour, explaining the process. They produce red, white and rose varieties here and serve it with cheese, cold cuts and organic fresh produce like tomatoes, olives, homemade bread and olive oil. The wine is so good you might end up buying bottles to take with you! Another place you must visit in Greece is Santorini. Santorini is the most popular of the Greek islands, for many good reasons. With gorgeous cliff-side villas overlooking the caldera, and stunning sunsets, you can’t help but fall in love with the island. The whole island stops for the sunset, so make sure you find a good spot and get there early to get a view as the sun drops over the horizon. While the small alleys along the cliffs can be busy, take a catamaran cruise out on the water for closer look at the volcanic hot springs. While the walk to the Red Beach can be dangerous, seeing the beach in person, with red cliffs and dark sand, is gorgeous. Make some time to do the walk from Fira to Oia. While the walk is tough but beautiful, it can take between 3-4 hours. If you can afford it, book your stay in a villa along the caldera for a seriously amazing view. The extra money spent on a private plunge pool villa was absolutely worth it when you see the view. Make some time to do the walk from Fira to Oia. While the walk is tough but beautiful, it can take between 3-4 hours. If you can afford it, book your stay in a villa along the caldera for a seriously amazing view. The extra money spent on a private plunge pool villa was absolutely worth it when you see the view. Which of the places has been added to your bucket list? Do you agree that these are the most beautiful places in Greece?